So here's our improved version... lots of meat, lots of flavor (lots of spice!) and no bones. 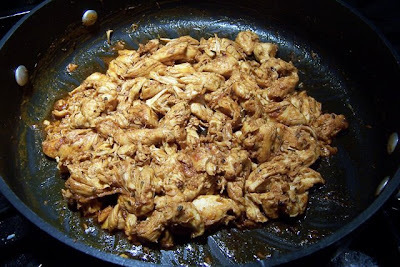 We call it "East Buffalo Chicken" because, well, we live East of Buffalo, and we live on East Buffalo Street. Cool, eh? *okay, I'm cheating here. We like to keep a bag of frozen chicken breast tenderloins in the freezer for a variety of dishes. These bags o' chicken can be found at your local wholesale warehouse-style store, and sometimes at your local grocery store. You could also do what Bobby and Shelly do and pick up extra chicken when you see a good price, and pop it in the freezer. I like the frozen tenderloins because I can drop them in pan frozen, and they STILL cook up quickly. What can I say, I'm all about the easy. 1. Heat about a tablespoon, or two, of pure olive oil in a skillet over medium heat. 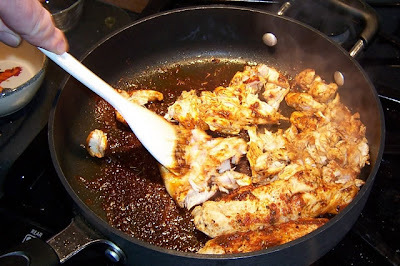 When the oil starts to ripple slightly, carefully place the chicken in the skillet to cook. 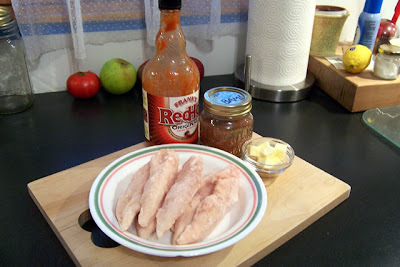 While the chicken cooks, sprinkle a generous amount of the Louisiana seasoning over the chicken. 2. 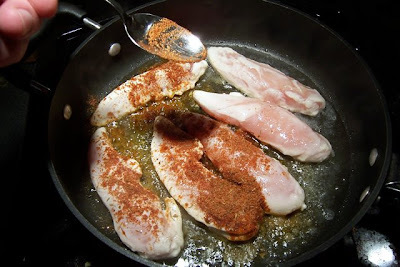 When the one side is cooked, flip the chicken and hit the other side with the seasoning. Continue cooking until it's almost done. 3. 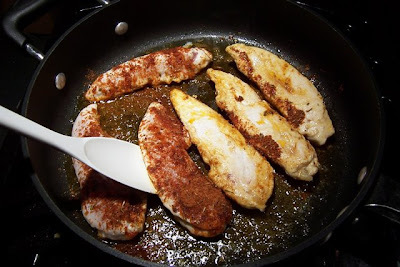 Now, take your utensil of choice (I prefer a slightly flat-edged spoon) and go medieval on the chicken to break it up into bite-sized pieces. Let the chicken finish cooking. 4. 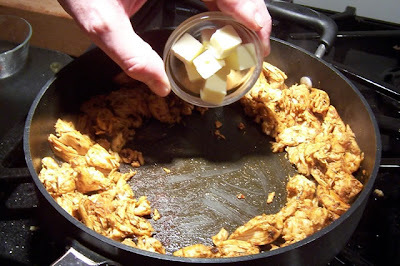 Move the chicken to the outside of the skillet, and drop in the butter to melt. 5. 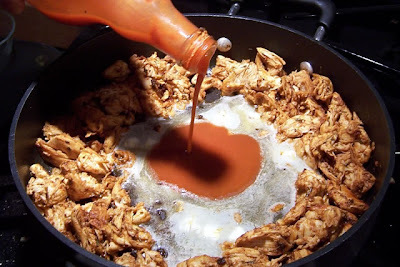 Add the hot sauce, stir just to combine, and turn off the heat. It's like this... further heating will cause the butter to seperate and leave your sauce very oily instead of creamy (the sauce will "break"... yup, that's a cooking term for "fail". Use it sometime, and watch the looks you get.). 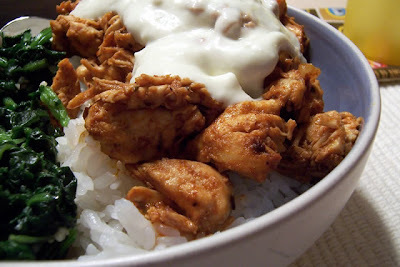 We like to serve the chicken over steamed white rice, with a big honkin' (that's a technical term) dollop of bleu cheese dressing. Serve up a side of your choice and you're good to go. 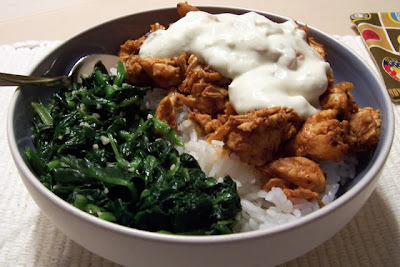 I've been a bit behind on reading the "dinner" posts but in catching up I have to say ~ this looks really good and I'll absolutely be trying it! Thanks.